Whatever your sport, resting and relaxing your muscles after a workout is absolutely essential. 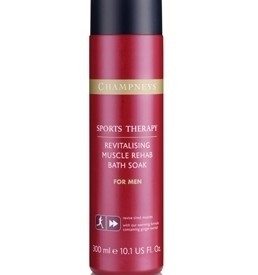 Our therapists have designed this warming, revitalising sports formula to help ease muscle discomfort by deeply soothing and relieving tension. 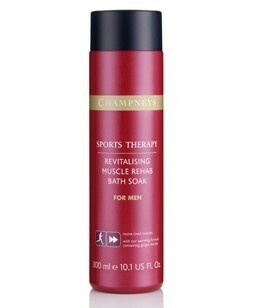 Our sports therapists recommend pouring under warm running water. Aqua (Water), Sodium Laureth Sulfate, Cocamidopropyl Betaine, Sodium Chloride, Cocamide DEA, PEG-7 Glyceryl Cocoate, Perfum (Fragrance), Polysorbate 20, Dipropylene Glycol, Limonene, Glycerin, Butylene Glycol, Hexyl Cinnamal, Zingiber Officinalis (Ginger) Root Extract, Creatine, Disodium EDTA, Linalool, Butylphenyl Methylpropional, Triethylene Glycol, Benzyl Alcohol, Propylene Glycol, Citric Acid, Potassium Sorbate, Sodium Benzoate, Sorbic Acid, Methylchloroisothiazolinone, Methylisothiazolinone, Magnesium Chloride, Magnesium Nitrate. Sitting very much at the afordable end of the muscle both soak (Elemis £8.15 for 100ml to Original Source at 88p) this is a very nice alternative. I've never been convinced that anything is any more effective than a nice hot bath but it's nice to have the fragrance and the soft feel of the water. This oen works as well as any and given the price I think it makes a nice indulgent option.